Food during the Medieval times of the Middle Ages was changing. New spices such as Pepper, Cinnamon, Cloves, Nutmeg, Ginger, Saffron, Cardamom, Coriander, Cumin, Turmeric, Mace, Anise, Caraway and Mustard were being introduced by the crusaders from the East and included in Middle Ages Recipes. 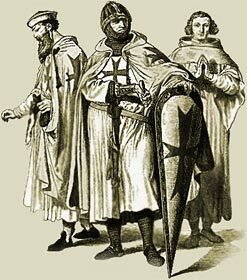 The early Crusaders had brought to England elements of Eastern cookery requiring spices and these were introduced into Old Medieval recipes . Spices were extremely expensive and therefore only used in cooking recipes by the Upper Classes. The use of Spices in Middle Ages cooking recipes therefore became a matter of both social fashion and social prestige. The importation of spices resulted in a highly spiced cuisine and new recipes for the nobility and spices were seen as a sign of wealth. Up to this point recipes consisted of foods that were home grown or occasionally imported from Europe. Traditionally, Middle Ages Recipes were passed from one generation to the next by word of mouth, when the art of cooking and recipes was passed verbally form mother to daughter or from master to apprentice. The first recipe books were printed in England during the 1500's - but these would have certainly included the recipes from the Medieval times of the Middle Ages. These old recipes were written in totally different way to modern recipe books. There were no lists of ingredients - these were included as part of the text. Food and ingredient measurements were extremely basic - quantities were not often specified. Temperature control was difficult and therefore not specified. Cooking times were vague - and left to the cook to decide and it was always assumed that the reader would already have some knowledge of cooking. An excellent way of dressing Fish. Take a piece of fresh Salmon, and wash it clean in a little Vinegar and water, and let it lie a while in it, then put it into a great Pipkin with a cover, and put to it some six spoonfuls of water and four of Vinegar, and as much of white-wine, a good deal of Salt a handful of sweet herbs, a little white Sorrel, a few Cloves, a little stick of Cinamon, a little Mace; put all these in a Pipkin close, and set it in a Kettle of seething water, and there let it stew three hours. You may do Carps, Eeles, Trouts, &c. this way, and they Tast also to your mind. To fricate Sheeps-feet. Take Sheeps-feet, slit the bone, and pick them very clean, then put them in a Frying-pan, with a Ladlefull of strong Broth, a piece of Butter, and a little Salt, after they have fryed a while, put to them a little Parsley, green Chibals, a little young Speremint and Tyme, all shred very small, and a little beaten Pepper; when you think they are fryed almost enough, have a lear made for them with the yolks of two or three Eggs, some Gravy of Mutton, a little Nutmegg, and juyce of a Lemon wrung therein, and put this lear to the Sheeps feet as they fry in the Pan, then toss them once or twice, and put them forth into the Dish you mean to serve them in. A Singular Receit for making a Cake. Take halfe a peck of flower, two pound of Butter, mingle it with the flower, three Nutmegs, & a little Mace, Cinamon, Ginger, halfe a pound of Sugar, leave some out to strew on the top, mingle these well with the flower and Butter, five pound of Currans well washed, and pickt, and dryed in a warm Cloth, a wine pint of Ale yeast, six Eggs, leave out the whites, a quart of Cream boyled and almost cold againe: work it well together and let it be very lith, lay it in a warm Cloth, and let it lye half an hour against the fire. Then make it up with the white of an Egg, a little Butter, Rosewater and Sugar; Ice it over and put it into the Oven, and let it stand one whole hour and a half. The Medieval Times website provides interesting facts, history and information about Medieval times including Medieval Recipes. The Medieval Times Sitemap provides full details of all of the information and facts about the fascinating subject of the lives of the people who lived during the historical period of the Middle Ages. The content of this article on Medieval life and times provides free educational details, facts and information for reference and research for schools, colleges and homework for history courses and history coursework.